"Berge Stahl". Sao Luis, Brazil, 20.11.2005. 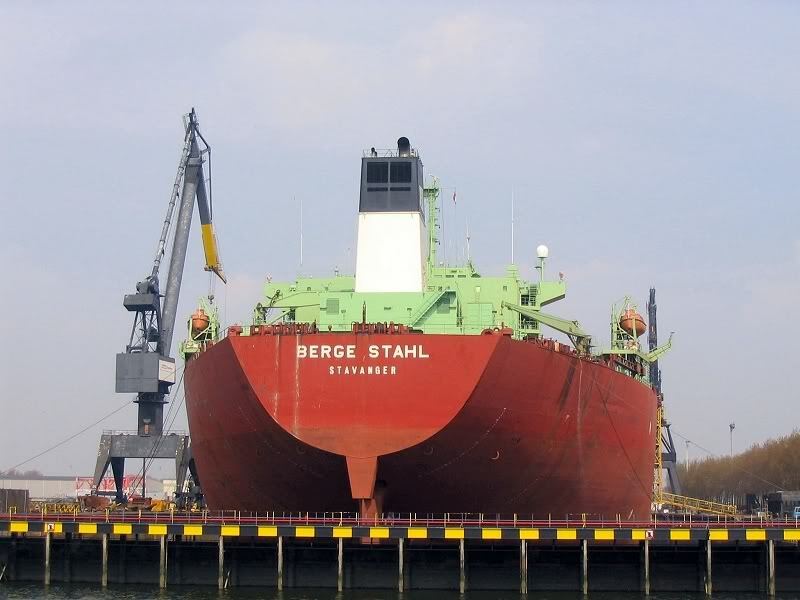 "Berge Stahl", in her new livery. "Berge Stahl", at Rottredam, January 11th, 2014. 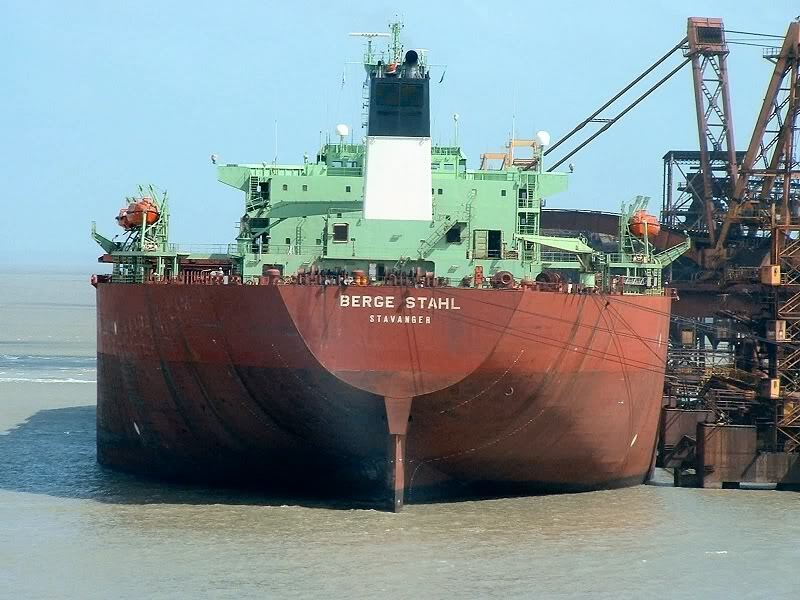 The Miramar Ship Index for "BERGE STAHL"
Do you wonder what is looking the largest bulk carrier vessel built ever. That definitely is MS Berge Stahl. 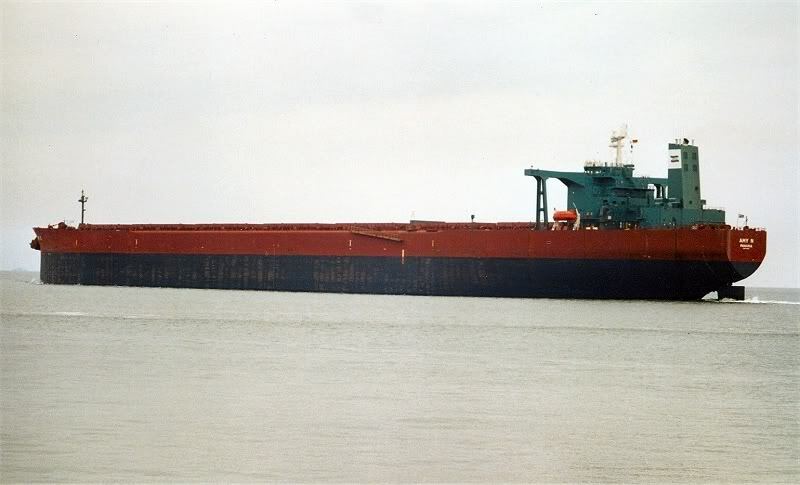 The ships is part of the fleet of Bergesen d.y. ASA. The flag of the ship is in Stavanger, Norway. 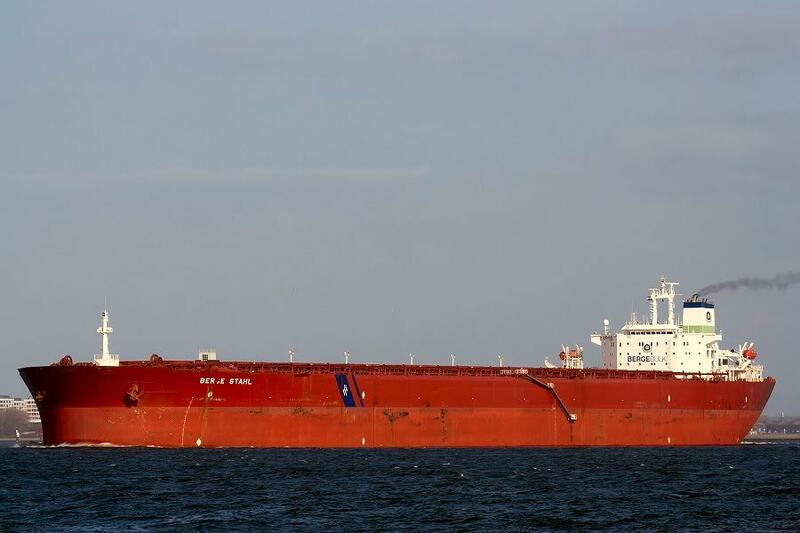 This is a little bit strange, because it was previously registered in Monrovia, Liberia, but with changing of ship-owners they changed the flag too. 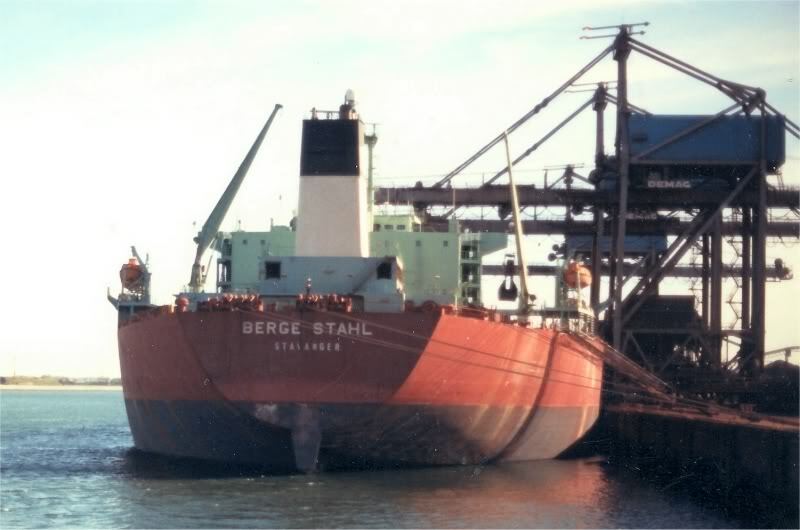 The ship MS Berge Stahl is designed to carry iron in bulk. Her deadweight is a 364,767 m.t. and has a length of 343 mtr. 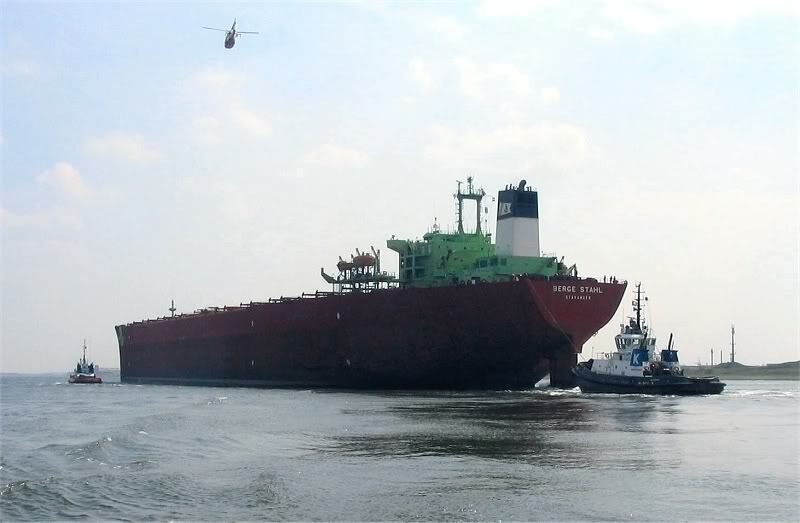 The enormous ship has a width of 65 mtr and its draft is 23 mtr. 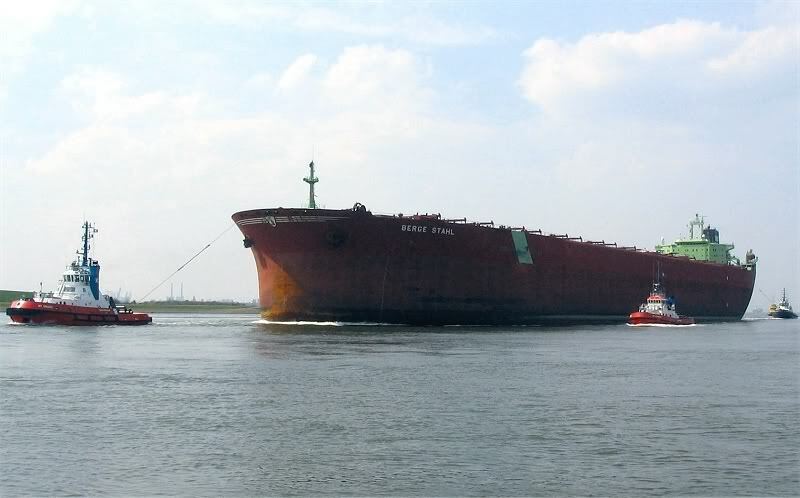 The vessel was built in 1986 in the ship-yard of Hyundai Heavy Industries. 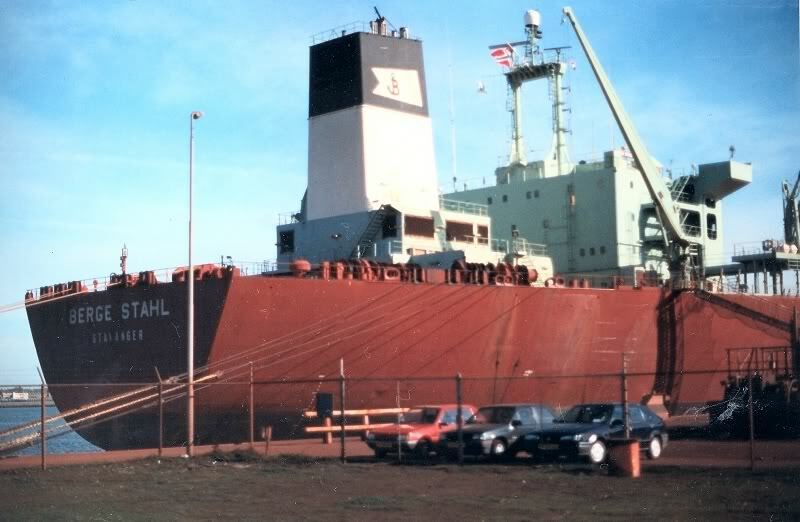 So big ship should has a heavy engine, which should give to it enough power to made this weight go through water. The main engine is Hyundai B&W 7L90MCE with power of 27,610 horse powers, which is nearly 20.59 MW. The top speed of MS Berge Stahl is 13.5 knots. Interesting about the heavy unit is that only the rudder is 9 mtr in height and the main engine has the measurements of 9x9 meters. 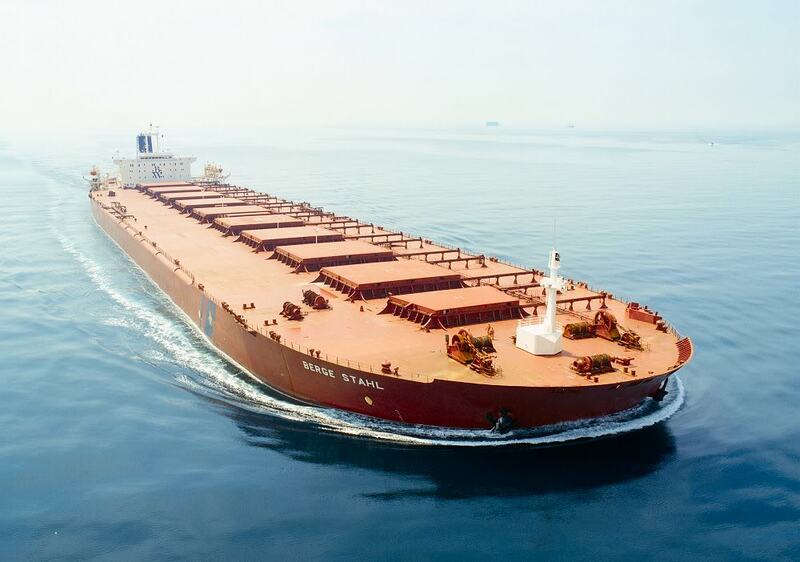 Due to its large lenght and width and also due to its big draft, when it is fully loaded the ship can handle in only two ports of the world. 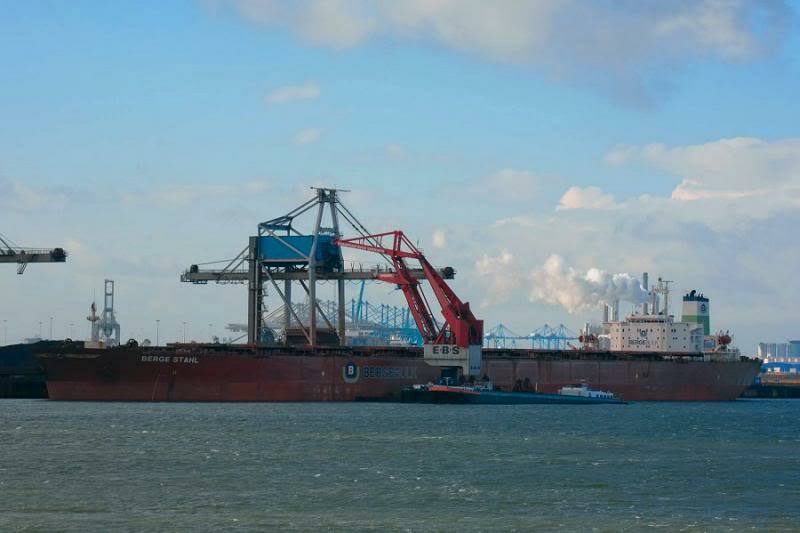 That is why the ship is making courses to Europort in Rotterdam, from the Terminal Maritimo de Ponta da Madeira in Brazil. 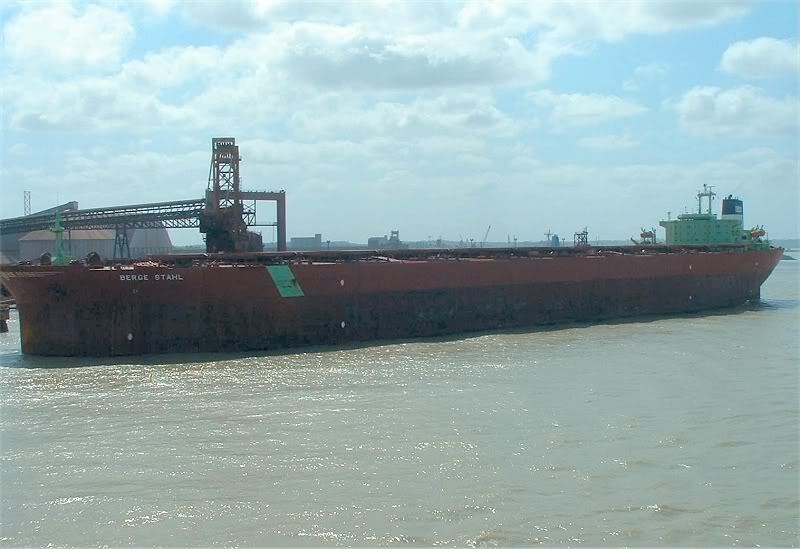 Even in these ports it takes a lot of time to be maintained this ship and in some cases in low water it can go aground. 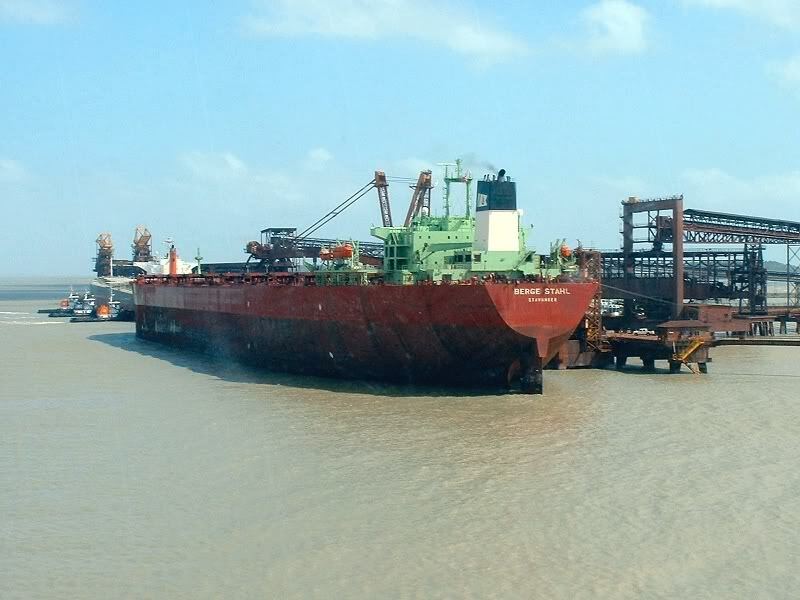 In the world there are also some ports that are taking this ship, but they are reducing the weight of the ship in the bay and just after that it is coming in. 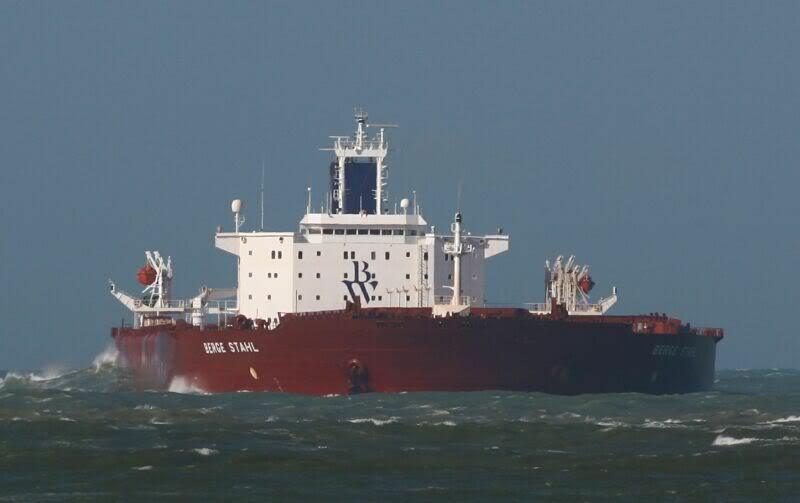 But this ship is wonderful and very beautiful with its large size and its large deadweight. I like it very much and I'm sure you will like it too. MS Berge Stahl is one of the wonders of engineer plan and one of the man made wonders of the world ever.